Fancy a tour to one of the most enchanting and utterly beautiful places in Scotland? 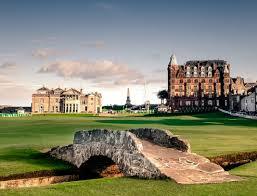 Then let Scotty Tours whisk you away to bonny St Andrews in the majestic Kingdom Of Fife if the answer is yes! We start however at the world famous Old Course for some fantastic photo opportunities including the iconic Swilcan Bridge. Stand where Nicklaus, Watson and Palmer have stood as you say cheese for the camera. A Scotty Tours tour isn’t complete without a beauteous castle in the mix, so it’s on to St Andrews Castle next for a look at this picturesque ruin. The castle sits on a rocky promontory overlooking Castle Sands and the adjoining North Sea. Home to many Kings, the castle was also used as a prison! A wee pit stop for refreshments before we head to the stunning St Andrews University. This was the place where second in line to the British throne, Prince William, met his future bride Kate Middleton. Princes and Princesses? Told you Scotland was the most romantic country in the world didn’t we! The University, the oldest in Scotland, with international renown for research and education, is situated in the picture postcard town. There aren’t many prettier and historically interesting places to stroll around than St Andrews, so let’s go. Packed with great outdoor places to explore and enjoy and full of attractions, festivals and events, we did tell you that there was far more to St Andrews than golf. Wander at your leisure and discover all the nooks and crannies in this unique wee place. Steeped in history, you’ll learn as you explore that our patron Saint St Andrew was first recognised as patron Saint of Scotland in 1320. Andrew is also the patron saint of Greece, Romania, Russia and Barbados, but we don’t have time to visit those places this time round. The presence of St Andrew’s relics in Scotland – a tooth, a kneecap, an arm and finger bones! – meant that St Andrew’s became a popular medieval pilgrimage site although they were destroyed in the 16th Century during the Scottish Reformation. Safely home and tucked up in your comfy bed, St Andrews will inhabit your blissful dreams for years to come. Please book early for this popular tour to void disappointment.